Looking to help a friend out with some information regarding a newish housing estate. The estate is built in a town called Muirhead, which is on the outskirts of Glasgow. It is served from the STEPPS exchange and the estate has just had a new cabinet installed. Just a standard cabinet, not the Huawei cabinet which indicates FTTC. Site is built by Persimmon and is named Heathfields. Yellow is the new area that P23 will serve and purple is P19 which shows the estate it serves. It's cabinet number 23 and it is definitely very new as looking at CodeLook's website, they don't have it listed yet but on DSL checker (and Digital Scotland's Where and When), it references P23 - Typical postcode for the area is G69 9FH. As Stepps fell under the Scottish Government roll out, would it be expected for the Scottish Government to catch this one in the near future? Any help would be appreciated, as always! Still baffles me to see new housing estates going up and not going for a FTTP route, especially following on from the Athletes village in Glasgow being installed 2-3 years ago (after games ended and a retrofit carried out). Considering the high value of this particular housing estate, it's got to make commercial sense to tap into those with a higher income the possibility of having a greater budget for a higher priced internet service. A lot depends on when the estate started, new ones starting the journey now with > 30 premises get FTTP offered, but even then a belligerent builder can still mean the estate gets just copper. Some new builds even lock out Openreach and go for independents, so if builder felt it was important there would be lots of options. That was my thinking as well. It would then fall under the Scottish Government works. I can only assume that cabinet is not listed on any future phase. 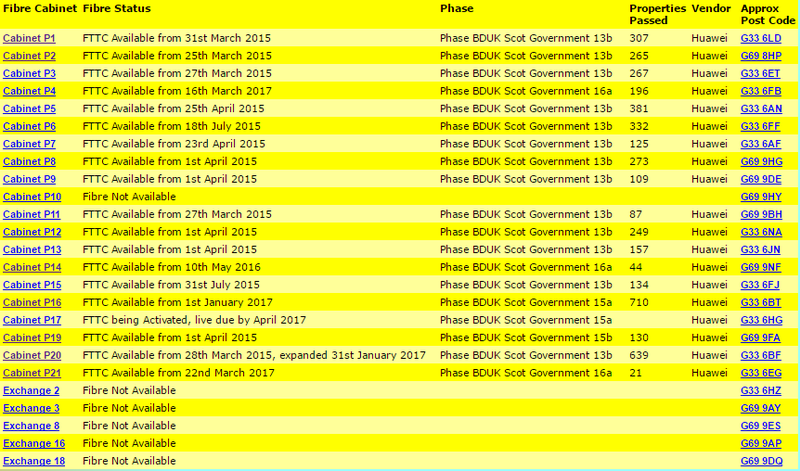 All the cabinets on STEPPS were picked up under the Scottish Government phase. Absolutely put pressure on Persimmon to co-fund the cost of the upgrade with Openreach. Take it to the local press if needs be. There's big noise being made about developers not ensuring decent connectivity is provided these days. The last thing they'll want is negative publicity. If they're still building on the site, consider a sign in your garden that prospective buyers will see, informing them of no fibre broadband availability. Still no sign of fibre activity within this area. Total number of properties in here are going to be 156 properties and there are now 87 of them sold. Interesting thing I found is that on the map here - https://drive.google.com/open?id=18hFiLa2T8CG6UMWqSw... - the area named Woodend Farm actually has a Fibre to the Premises. It appears Openreach ran fibre direct to this premise and a few others south of here linking up with Woodhead Road. The staff at Persimmon definitely can't help here but who is the best person direct at Scottish Government level or Openreach to contact to enquire about it?